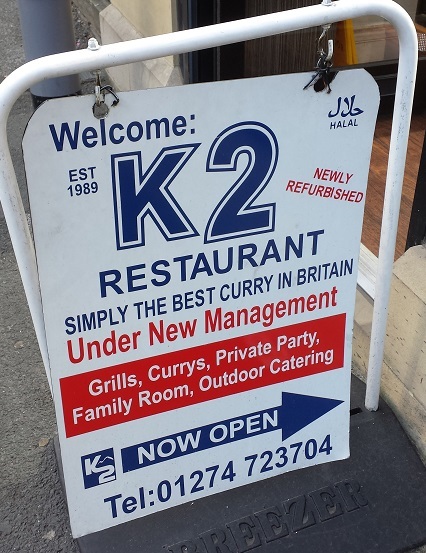 This month’s ghee-sodden guide to Bradford’s curry houses contains three establishments for which the terms “no frills”, “no nonsense” and the retort “no sh*t?” were possibly created. Not there for the décor though, are we? It’s a couple of doors down from the once fabled Sweet Centre and came with approving nods from those in the know who likened the fodder to traditional home-cooking. We were completely unbiased, though, seeing as how we’d never heard of it. Unsurprisingly, as we were the only ones in on a Sunday afternoon, we were given a warm welcome, and an unsolicited bowl of complimentary pakoras landed on the table with steady-away starters of seekh kebabs and samosas. 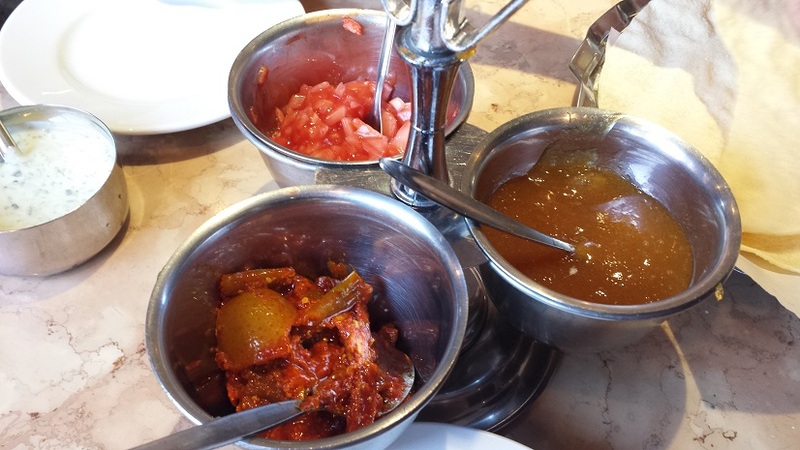 We got roti-deep in a chicken madras, a meat madras (the enigmatic ‘meat’ usually being lamb or mutton, but, ask no questions…) and a chicken karahi, all of which were tasty, fiery and about 6 quid. About halfway through, something weird happened. The mum-jokes dried up [don’t] and we three seasoned eaters were defeated. We hadn’t ordered loads, and we can’t blame it on over-priced lager as we were on the soft stuff, (though you can take your own grog) which led us to conclude that either the world was ending or they’d been a bit keen with the ghee. Probably the latter. We paid about a tenner each which is excellent value given that you won’t need to eat for 3 weeks afterwards. 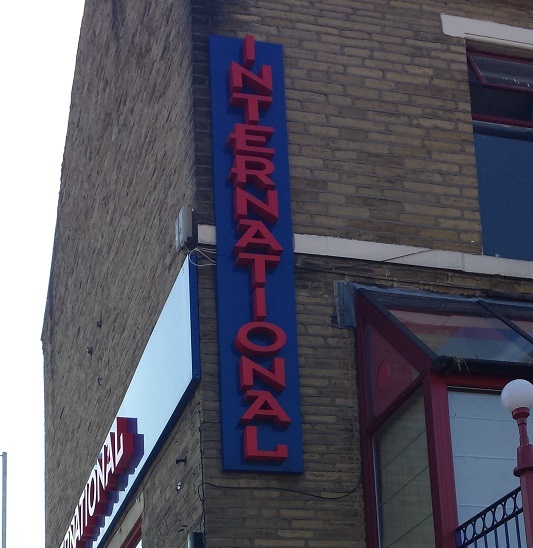 Over at The International, service is best described as effusive. When we asked what their booze policy was (like Paxman, we home in on the important stuff,) the gaffer was halfway out of the door, saying that he’d nip to the shop for us, before we convinced him we’d be fine with water. Free poppadums arrived with a salty, bitter and zesty lime pickle good enough to take home, if we’d have remembered to ask. 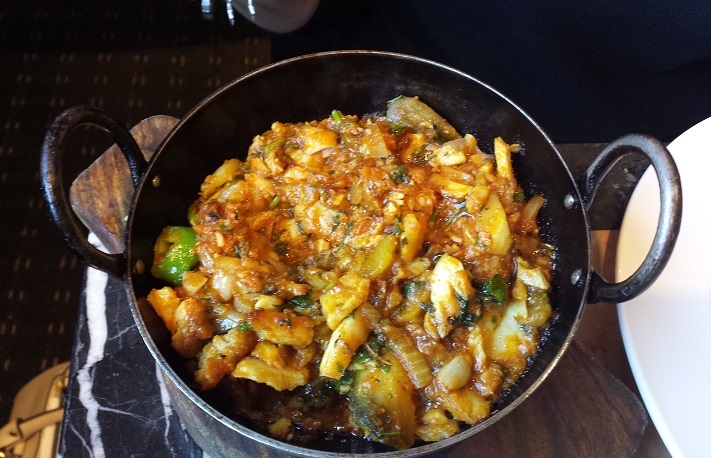 We ate a chicken karahi (got to be consistent) and a fish karahi to the background chatter of an Asian soap opera on one of several TVs in which, from what we could make out, trouble was brewing due to an unscrupulous fruit and veg trader. Oddly addictive. 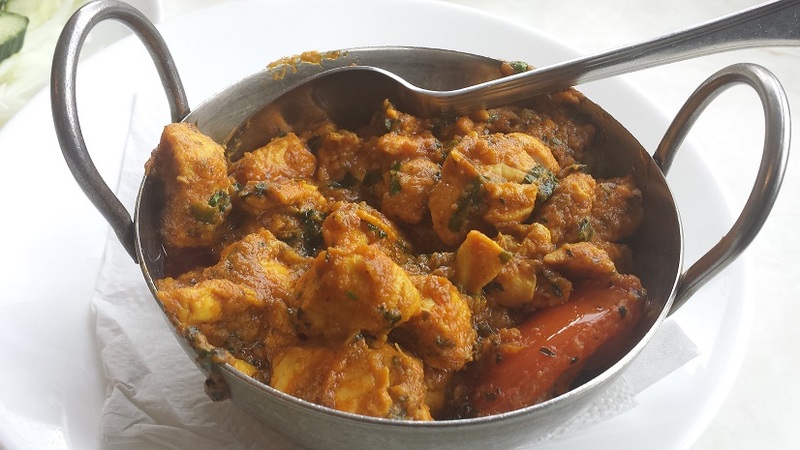 The chicken was the sauciest of the curries so far, but still generously portioned and with slow-building, brow-dabbing heat. 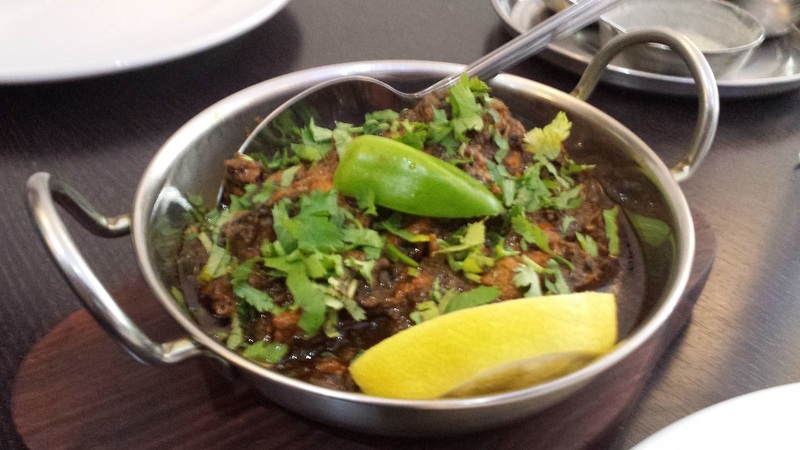 It was £18 for a couple of curries and an unnecessary starter of chilli pakoras. The fish was lighter but still full of flavour, & we polished the lot off. There were hugs from the gaffer as we left and we’re now best friends. 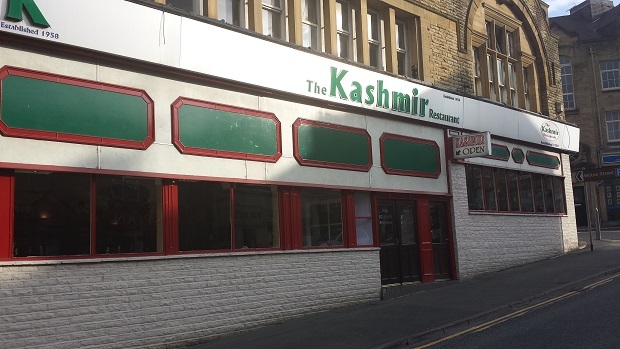 It’s a sign of how divisive the subject of Best Curry in Bradford is that when we told a mate we were going to the Kashmir and not the Karachi – a couple of hundred yards further on – we were met with blasphemous, abusive (although impressively articulate) texts. 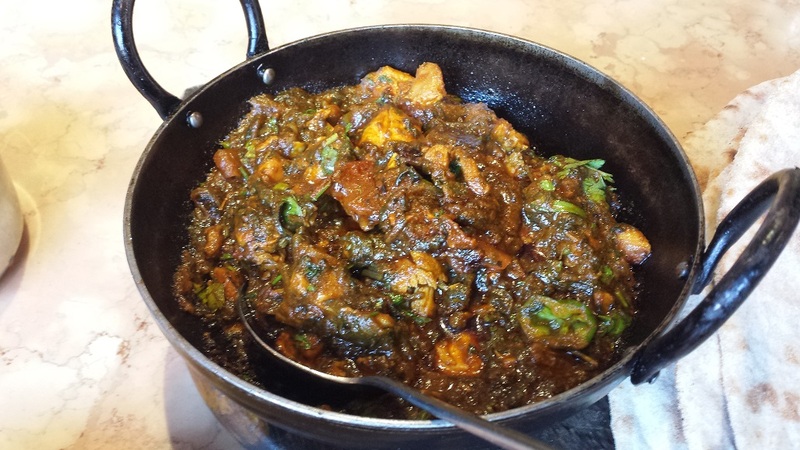 On the flipside, we know someone whose weekend teatime isn’t complete without driving into town to pick up his Kashmir ‘meat curry’, return home, and tuck in whilst guffawing along to sh*t Saturday Night TV. Of the 3 entrances to choose from, we got it wrong which resulted in us sitting upstairs on our tods while the cool kids (council workers) went downstairs. We weren’t grumbling too much as there was a TV and we were keen to learn how the situation with the rogue fruit and veg trader had panned out. 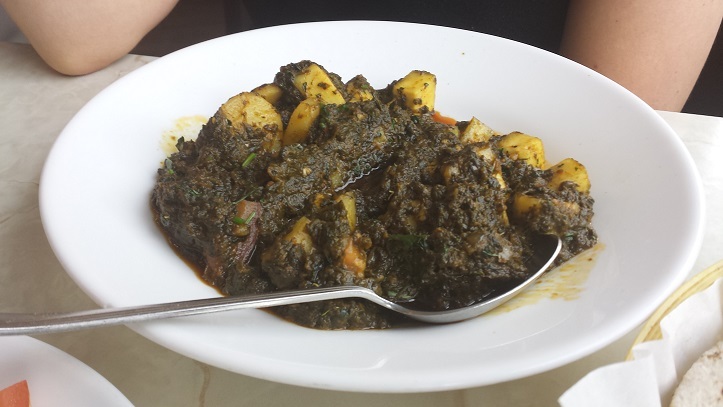 A spinach, potato and paneer curry was iron-rich, wholesome, rainy-day stuff. Ironic, given it was the hottest day of the year. 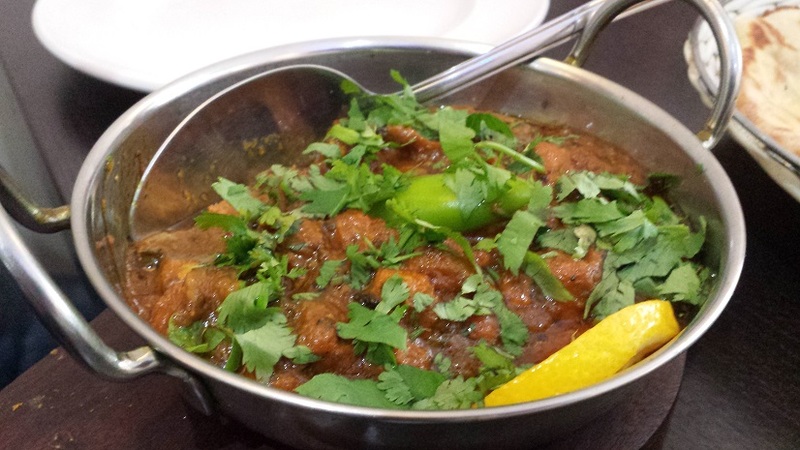 The chicken karahi was the meatiest, chunkiest and hottest of the curries so far. The bill for the two was £12 and it’s pricing like that that helps you to turn a blind eye to the “retro” interior. You can take your own booze, too. We’d eat in any of these places again; quibbles are easier to overlook when you’re being charged less than a tenner for, on the whole, good food. But it’s The International that ticks the most boxes – good food, handy location, best choice of soap opera – and therefore wins this bout. Ahhhh takes me back to student days-a good curry for next to nothing, plastic tablecloths and a good chapatti to mop up any residue. Worth exploring again after reading your blog. I’m sure you will have a second wind with the Mum jokes! !